Make sure that the watch is connected to your phone. Make sure Bluetooth and Wi-Fi are activated on your phone. Open the Wear OS application. On the top left of the display, make sure the status is Connected. Make sure that the Simplifeye app is installed on your Wear OS device. Even if you don't have Simplifeye installed on your Wear OS device, you're still able to receive notifications on it. However, if you do tap a notification and are unable to open it, it is likely that Simplifeye is not installed on your Watch. On your watch, swipe down from the top of the screen. If Simplifeye is not listed there, you'll need to install it from the Play Store. Swipe down from the top of your screen and tap My Apps. If you see Updates available, tap Update all. Otherwise, your watch apps are up to date. Make sure both Do Not Disturb and Airplane mode are turned off. If either Do Not Disturb and Airplane mode are activated on your Watch, you won't be able to receive any notifications. 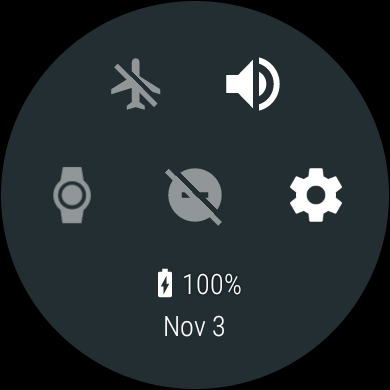 If the screen is dim, press the power button to wake up your watch. While using your watch, swipe down from the top of the screen. Make sure that Simplifeye is NOT on the list. If Simplifeye is on the list, Next to the app, tap Close next to its name. Restart your Watch and phone. Restart your phone as you normally would. To restart the Watch, you'll need to do the following. Tap Settings > System. If you don't see Settings, swipe left until you see it. Scroll down and tap Restart.